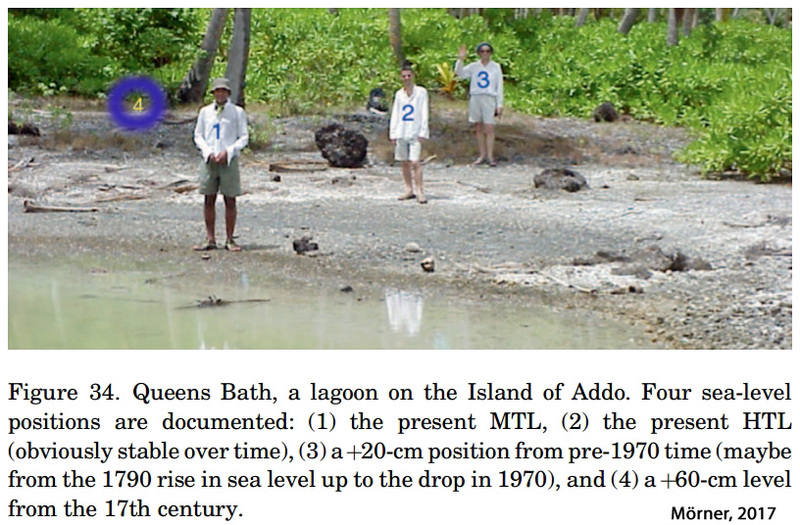 A year ago, several geologists (Kench et al., 2015) published a paper in the journal Geology that revealed a curious phenomenon occurring along island coasts in the tropical Pacific. Despite some of the highest rates of sea level rise in the world in this region (over 5 mm/yr on average since the 1950s), the total land area for these islands has not only not shrunk while sea levels were rapidly rising, the coastal land area has expanded — by a net +7.3% — over the last 118 years. Then, a few days ago, 6 scientists (Donchyts et al., 2016) published a paper online for the journal Nature confirming that the curious phenomenon in the tropical Pacific — coastal land growth exceeding recent sea level rise — has also been occurring across the world, or on a net global scale, since the mid-1980s. The succinct translation is that sea levels aren’t rising fast enough to offset land area expansion. The world’s sea coasts are growing, not shrinking. Interestingly, in the BBC press release for their Nature paper, the Donchyts et al. scientists expressed surprise (“the most surprising thing”) that coastal land growth has offset the recent sea level rise, and admitted that their findings ran contrary to expectations. The researchers said Dubai’s coast had been significantly extended, with the creation of new islands to house luxury resorts. “China has also reconstructed their whole coast from the Yellow Sea all the way down to Hong Kong,” said Dr Baart. It’s a little puzzling that scientists should be surprised that the Earth’s coasts aren’t shrinking. After all, relative sea level changes are not the predominant determinative factor affecting the growth or recession of land area. Coastal erosion and accretion, tectonic uplift and subsidence…are far more influential. Along the coasts of Alaska, for example, the land surface has been rapidly rising (uplift) for many decades. Consequently, relative sea levels are falling in this region at a rate of -5 to -10 mm/yr (-2 to -4 inches per decade) according to NOAA tide gauges. Along the U.S. Gulf Coast, on the other hand, the land surface has been on a long-term sinking (subsidence) trend. Consequently, relative sea levels are rising at rates of +5 to +10 mm/yr (+2 to +4 inches per decade) according to NOAA tide gauges. Obviously, these regional sea level trends are only very minimally — if at all — connected to climate-related sea level changes — or, for that matter, anthropogenic CO2 emissions. As Testut et al. (2016) have concluded, “sea level rise is not the primary factor controlling shoreline changes.” It’s the “non-climate” factors that predominantly determine relative sea level changes over time. The sea-levels-are-dangerously-rising narrative has become so commonly headlined in the popular media that it is effectively considered an unquestioned “fact” that needs no further investigation. But some scientists have actually taken the time to investigate relative sea level rise in long-term records from tide gauges. And what they have found is that in some locations sea levels are rising, in other locations sea levels are falling, and most of the world’s tide gauges show that sea levels are stable, with no significant trends either way. In fact, scientists assert that the overall rate of rise from the 19th/20th centuries to now — including the most recent decades — has only been about 1 mm/yr, which is about 4 inches per century. These modest rates are well within the range of natural variability. Furthermore, even in the regions of the world where sea levels are indeed rising, and rising rapidly (i.e., the tropical Pacific), scientists have acknowledged that an anthropogenic fingerprint cannot even be detected in the sea level rise trends. Natural oscillations related to internal ocean processes are predominantly what drive sea level changes, not anthropogenic CO2 emissions. To summarize, the world’s shorelines have been growing, not shrinking, in recent decades. This growth or relative net change in coastal land area is primarily related to the effects of non-climatic processes such as coastal erosion (or the lack of it) and subsidence and uplift trends — just as the loss of coastal land area in some locations is predominantly due to these same natural non-climatic processes. Tide gauges averaged from all over the globe indicate that sea levels are rising very modestly, and well within the range of natural variability. In the regions of the world where sea levels are rising, the rise is predominantly due to internal processes, as an anthropogenic fingerprint in sea level rise trends has not been detectable. Of course, the above analysis does not fit the narrative of anthropogenically-induced dangerous sea level rise that will wipe out coastal cities and lead to the catastrophic displacement of 100s of millions of people world-wide in the coming decades. Perhaps this is why some may find this summary of scientific conclusions undermining this popular doomsday narrative so . . . surprising. Yes those so called fragile corals are anything but fragile. Considering the modern coral types have been on the planet for only 200 million years or so. And the climate has changed a bit during that period. Corals at Bikini Island fared better than the human populous after the nuclear tests carried out there. Some tropical corals can survive down to 60 metres (200 ft), and some cold water corals live at depths of 3,000 metres (9,800 ft). Also of note is that bleaching of corals does not necessarily mean they are dead, it does indicate they have flush out the symbiotic microbes that give them their colourful look. Some corals can survive many weeks in this state, before taking up a new set of symbiotics. All the reasons why this bleaching happens are not fully known, maybe some of them are completely natural cyclic event. Maybe the current bleaching event is corals naturally clearing out warm climate symbiotic microbes, and now gathering more cold climate symbiotic microbes. From https://en.wikipedia.org/wiki/Coral and many other sites. Oh no’s , Co2 triggered land inundation of the seas, unless we do something build more windmills urgently the seas will disappear and probably other bad things.